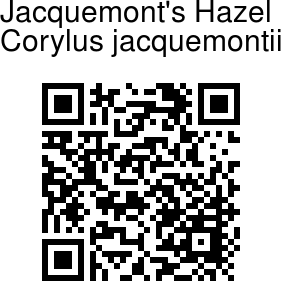 Jacquemont's Hazel is a medium sized deciduous tree, with thin dark grey bark. Leaves are broadly ovate, 8-15 cm, long-pointed, with doubly saw-toothed margins. Insignificantly small flowers arise in male catkins 2-4 cm long, and female spikes. Nuts arise in clusters of 2-3, each with a leathery, hairy, bell-like covering, up to 4 cm long, much longer than the nuts. The rim of the covering is cut into narrow linear lobes. 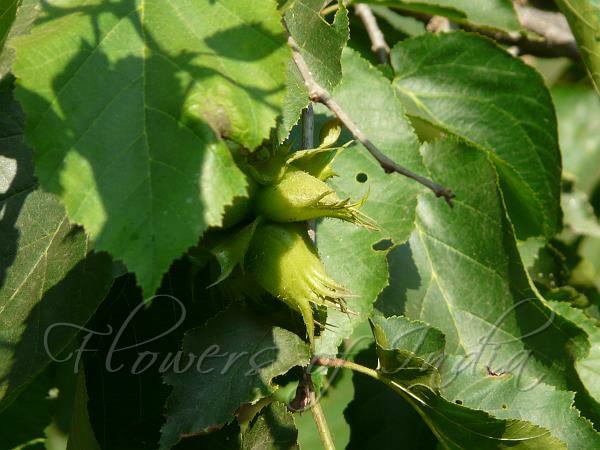 Trees are cultivated for the nuts, which are an important food. Jacquemont's Hazel is found in the Himalayas, from Afghanistan to W. Nepal, at altitudes of 1800-3000 m. Flowering: March-April.